Purva has an MBA (with Honors) from Indian Institute of Management at Ahmedabad (IIMA), one of the top-most business schools in India and Asia. She was a strategy consultant at McKinsey and then Assistant Vice President at ICICI Bank for structured finance in corporate banking. 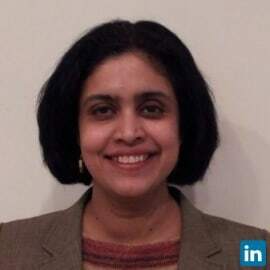 She relocated to Chicago in 2000 and along with other McKinsey alumni, founded Pipal Research, an outsourced provider of information research and analytics with an offshore model. She was instrumental in setting up Pipal’s delivery team in India and led Pipal’s financial services vertical, working with clients and leading the delivery team to analyze information into strategic insights.